UNED Research Journal publishes articles in all fields of science and welcomes feature articles (6-12 printed pages or pp); short reports (3-4 pp); and notes and range extensions (1-2 pp). Additional material (text, images, audios and videos) is published online as needed. We welcome manuscripts for our special sections: Reviews (reviews of the literature with a critical approach and practical recommendations for future research); Cases (data-based studies of particular problems with practical recommendations to solve them); Hypotheses (observation-based ideas for future research) and Forum (well argued opinions and recommendations). UNED Research Journal / Cuadernos de Investigación UNED (from 2009 through 2013, vols. 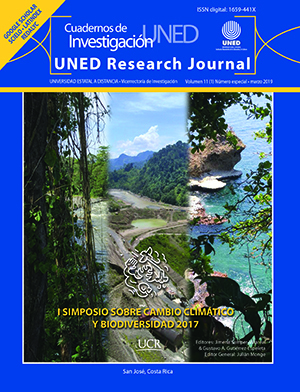 1-5, published as "Cuadernos de Investigación UNED/Research Journal of the Costa Rican Distance University". From 2009 until 2017 the journal was published in print and online versions.